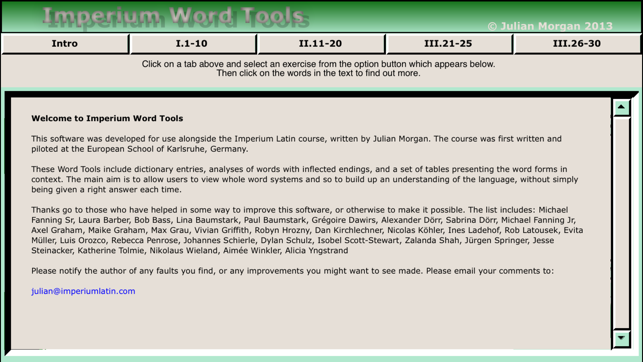 Imperium Word Tools is a highly developed modern system, designed to assist in understanding the Latin language. 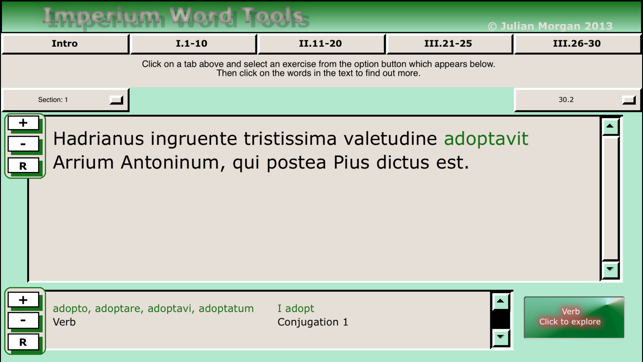 It offers a dictionary at the front end, which presents words and their dictionary entries in a conventional way. 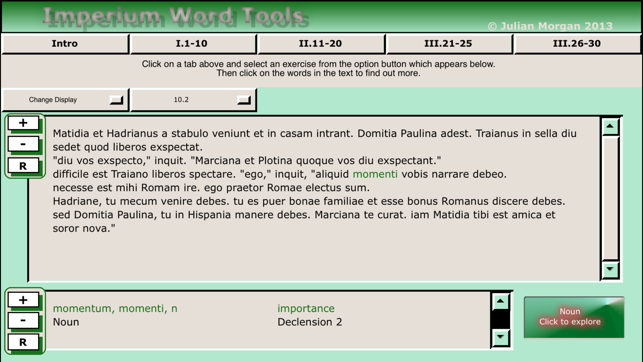 At this point the user can follow through to the second level, where each word is shown within its immediate system. In the case of non-inflected words, this is kept to a minimum, but in the case of nouns, adjectives and verbs, the whole system is shown. So, for example, a noun is shown with endings for all of its six cases, in the singular and plural. 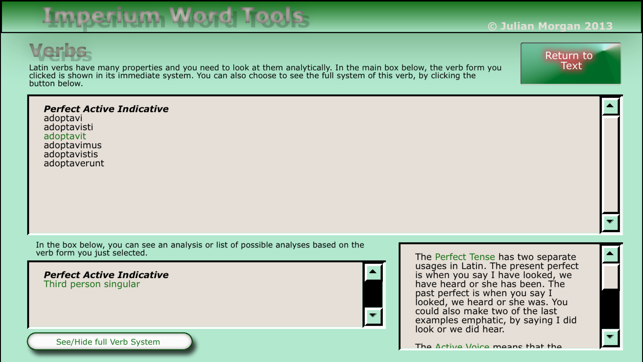 The exact form of the word as it appeared in the text is highlit in green, but this appears in each part of the table where it may be repeated, so the user can see all of the possible correct analyses for it. In the case of the word 'servi', for example, the word would appear in green three times, in the genitive singular, the nominative plural and the vocative plural. A set of texts is also presented, which explains the terms used in all of the possible analyses. In the case of verbs, a further text field can be called up, with all of the endings of the particular verb in question shown. Compounded verb forms have both parts highlit in green. The morphological analyser is gentle in sophistication and allows a reader to make decisions based on grammatical information. The effective target is to increase the user's attention to grammar and grammatical systems. No abbreviations are used in this process and every technical term can be explored. The target is to show the reader what is possible, explain the explanations, and allow him or her to make individual decisions about meaning. Julian Morgan has been a designer of educational software for more than 25 years and is well known in Classics teaching circles for his teacher training activities, not least in directing courses for the CIRCE Project, which has been part of the EU's Comenius programme since 2003. Minor adjustment change to version number only.